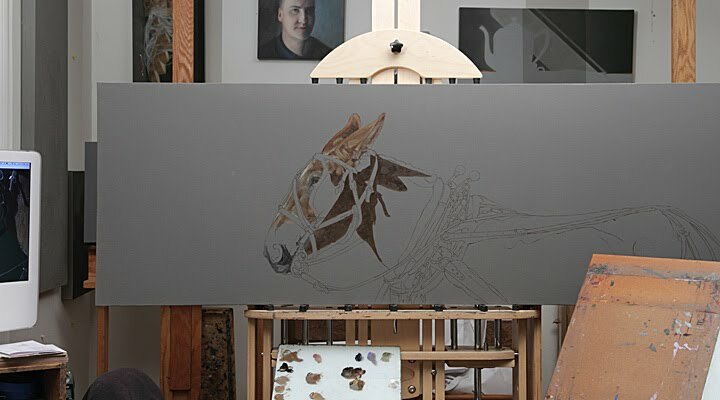 The first pass on the mule is complete, with the exception of the background. I still haven't decided on how to deal with that aspect just yet. I like where this is going, and have been having a good time with it. Now it's on to the second (and most likely, "final") pass. I'm looking forward to getting into the details of this painting, and there is a lot of detail in this composition. It's my favorite part of the process. I will probably hold off, and wait until the painting is done before I post another image. I have been slowly making my way through the first pass of the Mule. The rigging of the harness is almost done, then it's onto the body. I'll work on it a little more today, then we've got to get ready for the holiday. My brother Doug is coming in from New York, and will be with us until Sunday evening, so the remainder of the week will be spent with family and friends. Really looking forward to it. I'm also really looking forward to getting into the second pass of this painting. I love the second pass. The image above has been cropped in order to show more of the detail. I haven't decided about the background as yet. Dark or light, not sure. I should have another "in progress" pic sometime mid-week. If I buckle down, maybe the completed first pass. Hope you all have a nice Thanksgiving. I was finally able to compose myself enough to get back to the easel today. I've been occupying my time these last few days with mindless busy work. I had been vacillating back and forth between painting an aircraft I shot at an airshow a few weeks ago, and this mule. The loss of our pet put me in the mood to do an animal. I photographed this mule on our recent trip to Charleston, as it was pulling a large number of, not so athletic tourists. This is the first days work, and as with the Murray Grey, I plan to post images of each days work. If I don't make significant progress on some days, I'll combine multiple days effort into a single post. I'd also like to thank all of you who left comments here on my blog, and on FaceBook concerning the death of our kittie Scout. They were very comforting, and helped ease the pain of our loss. Karen and I lost our kittie Scout on Thursday. She had been running and playing all day as she always did, then came in for her regular afternoon nap. The weather that day was so nice we decided to take a walk at our local park. When we returned about an hour later, we found her asleep in one of her favorite spots, but when we petted her, she didn't respond. Scout was still relatively young and the personification of health. It has been a completely unexpected and devastating blow. Our only consolation was the belief that she passed peacefully in her sleep. The next day, after we had pulled ourselves together somewhat, we began to make a list of her wonderful qualities. It went on for five pages. One of my favorites, other than the fact that she was the happiest and most loving of kitties, was how she was always bringing us things. It began when she was very young, and she would bring us acorns. She would search for us with the acorn in her mouth, meowing earnestly, then drop it near us with a look that seemed to say, "this is for you". Eventually she moved up to pine cones. Without exaggeration, over the years, it numbered well over a thousand. Sometimes eight to ten a day. It was so cute to see her emerging from the trees with a pine cone in her tiny mouth. Occasionally she would add something new that she had discovered in some distant part of her territory; a styrofoam cup, a little plastic toy hand grenade, a badminton birdie, and once a little American flag. In the last few years, she began to raid our stash of plastic grocery bags I had tied into knots to line the trash. 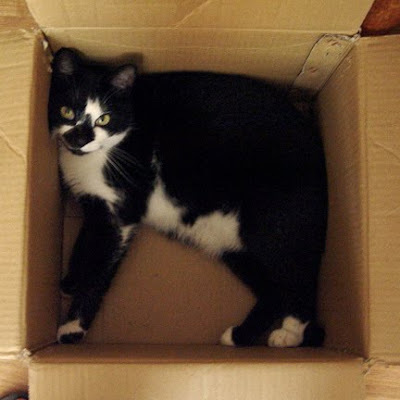 If we forgot to close the pantry door, you could hear her, usually in the evening, going through the big bag of bags, searching for that perfect one, then the meow as she made her way upstairs, followed by a soft crunch as she dropped it gently onto the floor at the foot of our bed. What I wouldn't give to hear that sound just one more time. Scout was a sweet, sweet kittie . . . .
Karen and I just returned from another of our quick regional trips. This time we were off to Charleston South Carolina to hook up with our friend Karin Jurick. The first weekend in November is the time for the annual Fine Art Weekend, and Painting in the Park, sponsored by the Charleston Fine Art Dealers Association (CDFA). 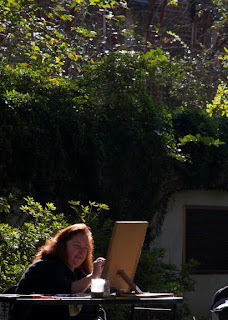 Karin was going to be participating in the Painting in the Park event, which culminates in an auction that evening. The proceeds from the auction will be used to support high school fine arts programs. The CDFA has donated over $150,000 since the event began back in 2006. 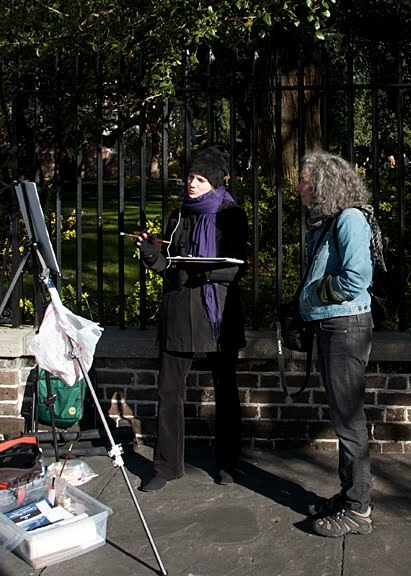 The event began bright and early Saturday morning, and the first artist we came across, painting just outside the gates of Washington Park, was Diane Feissel. Diane was very sweet and unassuming, and we had a wonderful time talking with her. 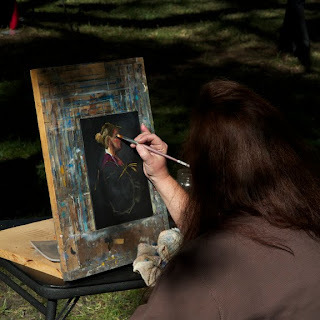 At the conclusion of the event, and having seen all the artwork produced that morning, Karen and I (and Karin Jurick as well) agreed that in our opinion, she had created the most beautiful painting of the day. It was a perfect day for an outdoor event, albeit quite cool in the early hours of the morning. Karin was sharing a model with another artist, and the poor girl was frozen by the end of the session. Fortunately the sponsors had provided hot coffee and muffins which helped take the edge off the chill, and everyone seemed to be having a great time. It was wonderful being surrounded by so many people supportive of school art programs. Logistically, Karin had secured a really nice condo in the heart of town that we all shared, and it was a great base of operations. The space had high, high ceilings with huge windows providing a wonderful view, and a rooftop deck for coffee and conversation. It was a terrific place to stay, and located only about a half a block from the hotel holding the auction. When things wrapped up in the park, Karin had some loose ends to tie up, so Karen and I headed out into the streets of Charleston. What a great city. A great "walking" city. We spent the majority of the day visiting the wealth of art galleries there. 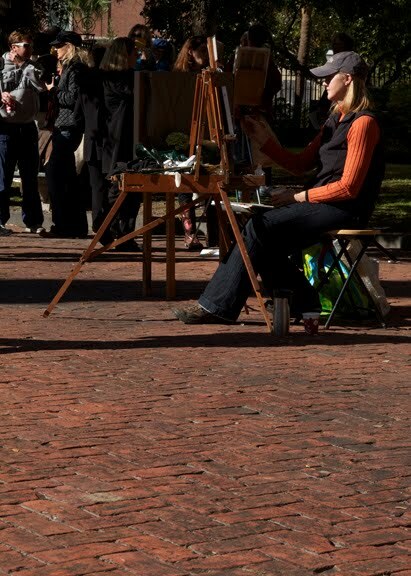 Karen Larson Turner (above) was having a show at Wells Gallery, and she also painted a wonderful little still life in the park on Saturday for the auction. 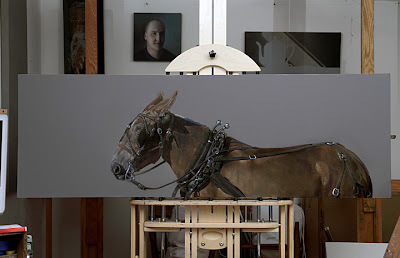 Mostly we wanted to see a new show at Robert Lange Studios. Robert, and his wife Megan, had put together a show titled, "Women Painting Women", and it was spectacular. The gallery was nearly overwhelmed with patrons the night of the show. It was virtually impossible to move around, and the number of red dots almost matched the number of the visitors. It was nice to hit the gallery again the next day after the crowds had died down, and really get lost in those amazing paintings. Karen had actually been invited to participate in the show, but at the time she was asked her schedule didn't allow any time to get the work done. She was kicking herself as we walked through the gallery, that she had missed the opportunity. All in all, it was a great trip. Perfect weather, good food, and really nice people. Karen and I were even recognized by a couple of fans of our work. That was very cool. Plus just getting to spend some quality time with Karin Jurick was priceless. I hope this was just the first of many trips to Charleston. p.s. On a side note, I sold the Murray Grey before it even reached the gallery. In actuality, it's not even really finished. I still have to varnish, edge, sign and wire it. Thanks to all of you wonderful people at Mason Murer Fine Art. 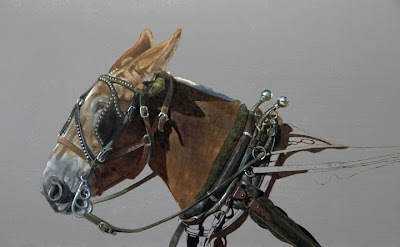 I shot a bunch of new mule pix in Charleston, so maybe I'll paint another big quadruped. I know, I know . 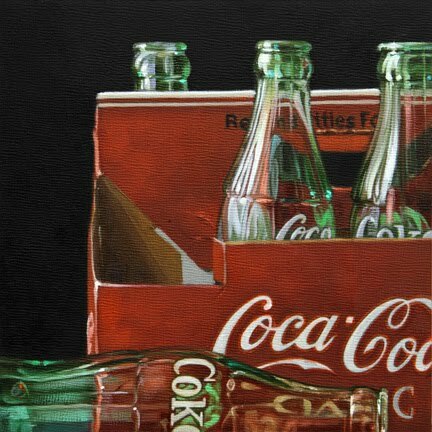 . . but there are still some people out there that would like to have a Coke Crate, and personally I like really like painting them. It's hard to beat that satisfying relationship between the colors red and green. If you'd like to bid on this painting, you can take part in the auction by clicking here. 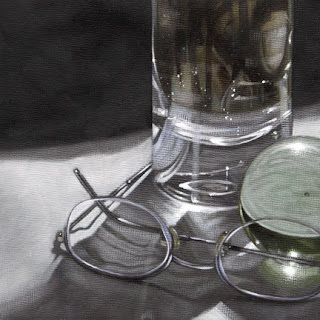 Last weeks "transparent" piece didn't satisfy my periodic need to paint glass, so I did another this week. If you'd like to bid on this painting, you can take part in the auction by clicking here. Before I get back to a larger gallery painting (whatever that turns out to be) I've got a few ebay pieces going up for auction this week. 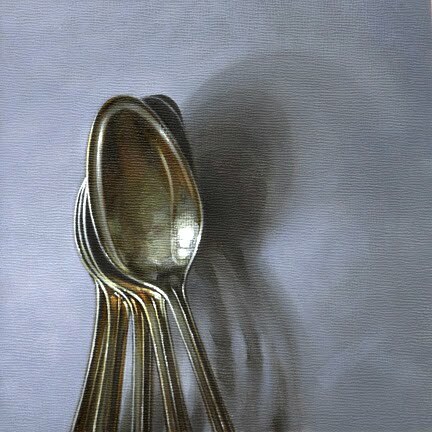 First off, one of my tarnished spoons. Love doing these flatware paintings. If you'd like to bid on this painting, you can access the auction by clicking here. I sent an image of the Murray Grey to Mason Murer Fine Art, and everyone at the gallery seemed to like it a lot. They've even decided to use it in a full page ad to be published in Atlanta Magazine, which I thought was very nice. Andrea sent me an image of the ad she had put together, and it looks great. She's got a great eye for design. Can't wait to see it in print. Mark also let me know that it, along with a number of my other paintings, will be included with pieces by many of his other artists in a trip to Miami for the Red Dot Art Fair in early December. Fingers crossed in the hope that many, if not all, will find themselves paired with red dots.